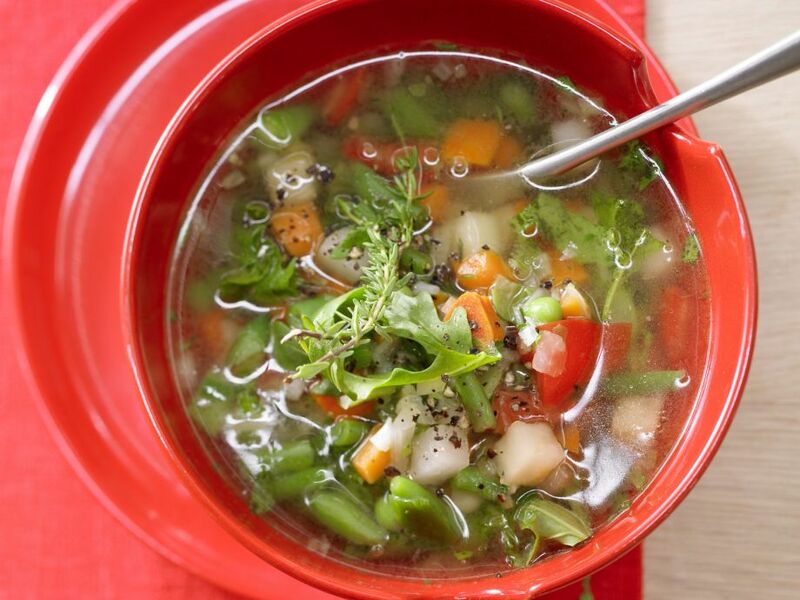 Quick Minestrone - Fast Italian Food: This super light vegetable soup takes only 30 minutes! 1 Peel the onion and garlic and finely dice. 2 Rinse thyme and shake dry. 3 Heat oil in a pot. Sauté onion, garlic and thyme over medium-high heat, stirring constantly, for 2 minutes. 4 In a large pot mix the broth, soup vegetables and bay leaf and season with salt and pepper. Bring the soup to a boil, cover and cook over low heat for 20 minutes. 5 Rinse tomato, cut out the stem and dice. 6 Rinse arugula and shake dry. Cut off and discard the coarse stems. Cut the leaves crosswise into strips. 7 Add the tomato and arugula, cover the pot and cook for 2 minutes. Season to taste with salt and pepper and serve.